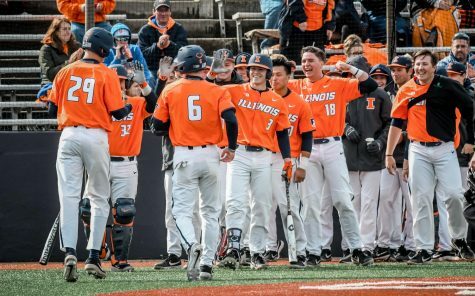 Illinois' Michael Massey (6) celebrates with his teammates after hitting a home run against Western Michigan at Illinois Field on April 18. 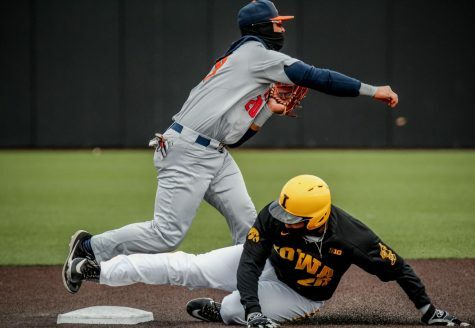 Maryland shortstop Kevin Smith rolled over on a fastball and hit a grounder at Illinois second baseman Michael Massey in the second inning. Massey fielded it cleanly and flipped it over to shortstop Ben Troike, who threw it to first baseman Pat McInerney for the inning-ending double play. Illinois’ promotions staff throws mini baseballs to fans if the Illini turn a double play in the second inning. 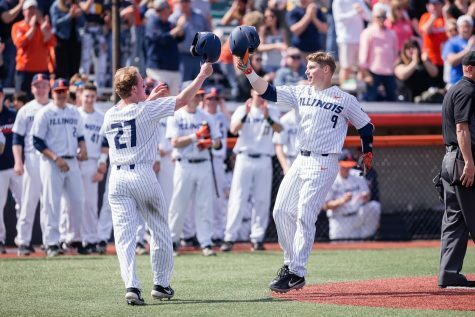 The official attendance of 1,675 at Illinois Field, much of which was made up of little leaguers, cheered loudly and hoped to get a plush ball. 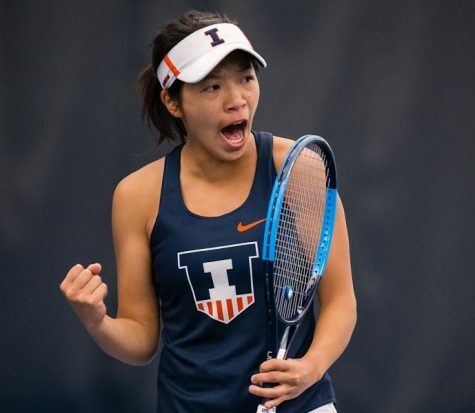 It was not the only time the crowd went wild in Illinois’ 6-2 win over No. 24 Maryland, arguably the biggest win of the season for the home team. Starting pitcher Cyrillo Watson said he appreciated the support from the Illini nation throughout the game. 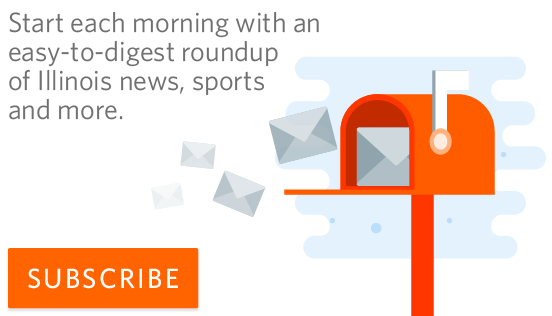 “Having everyone coming out and supporting us and believing in us is amazing,” Watson said. 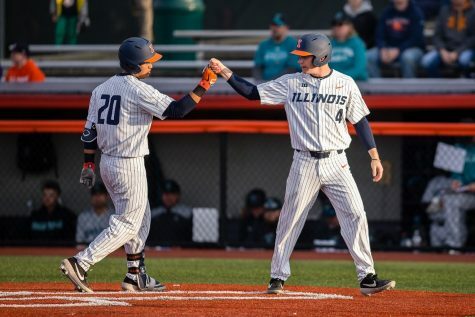 Illinois (20-24, 6-11 Big Ten) jumped on Maryland starting pitcher Tyler Blohm, exploding for six runs in the third inning and creating a raucous environment in Champaign. 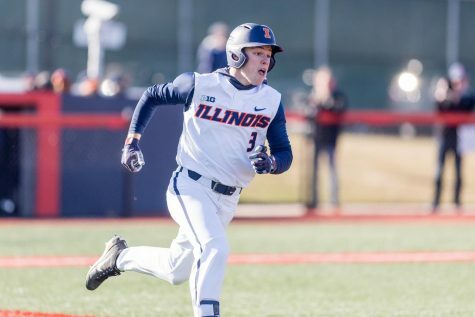 Maryland pounced on Illinois starter Ty Weber on Friday with eight runs over the first three innings. The Illini lost, 9-4. 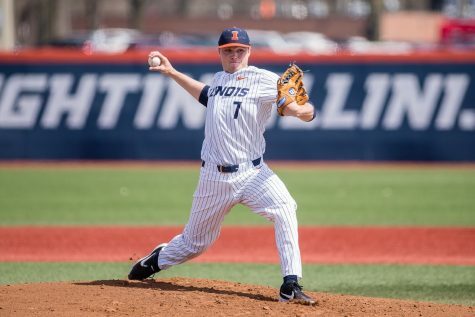 “Our pitching staff turned it around today after a tough night of disappointment for the entire team,” Illinois head coach Dan Hartleb said. 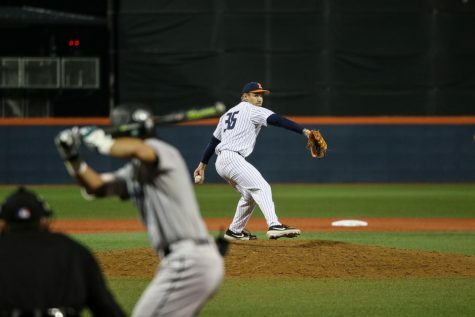 The left-handed Blohm had a 1.31 ERA over his last three starts entering Saturday, but head coach John Szefc pulled him after 2 2/3 innings and five earned runs. 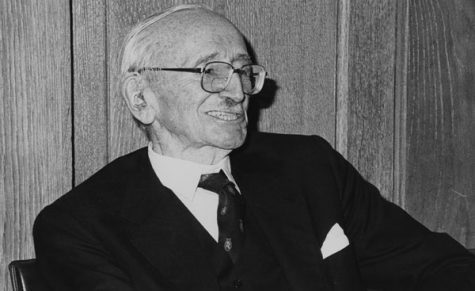 “(Blohm) got ahead with his fastball, so we decided to go out and attack him,” right fielder Jack Yalowitz said. 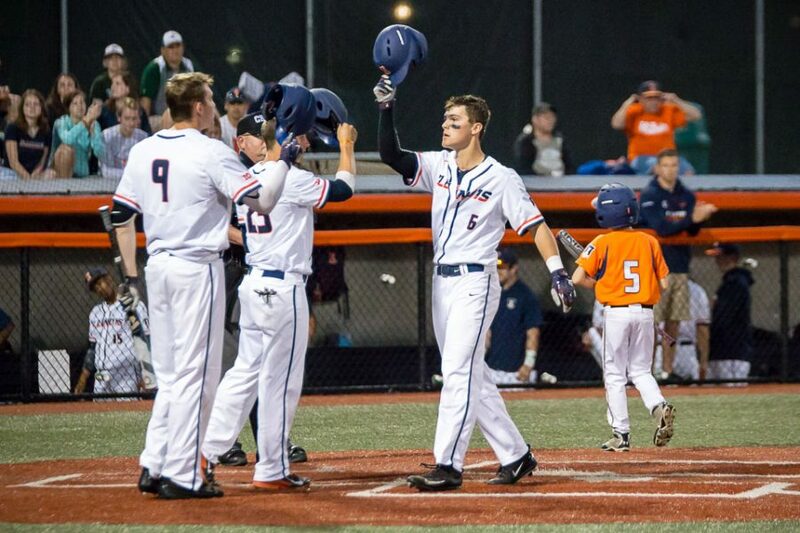 The Illini never let Blohm settle in and sent 10 men to the plate in the third inning. McInerney hit a third-inning RBI double for the second-straight game. Yalowitz went 3-for-4 and had three singles against the Terrapins. He hit his 11th home run of the season Friday. 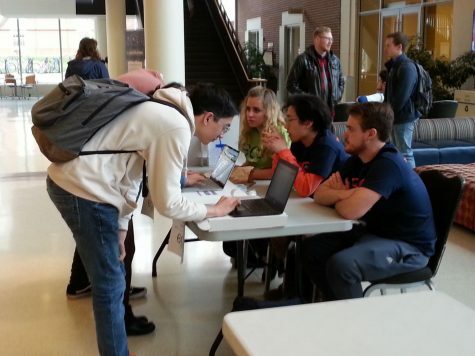 The sophomore said yesterday that the Illini needed to throw the first punch Saturday in order to beat Maryland. Watson threw a career-high seven innings and surrendered five hits and one earned run, a sixth-inning RBI double by right fielder Marty Costes. Watson finished with 97 pitches. Hartleb said he still did not consider taking the freshman out after the sixth inning. “His pitch count got up, and you could see his velocity was dropping a little bit, but Cyrillo really competes, and I wanted to push him,” Hartleb said. Third baseman Trent Hammond made seven putouts and a series of diving stops displaying his range. His seventh-inning error opened the door for one Maryland run. Michael Massey’s hitless outing snapped his season-high 15-game hitting streak. The second baseman has won the past two Big Ten Freshman of the Week awards. Massey stayed in the ballgame after requiring assistance following a dive to stop a ground ball in the eighth inning. 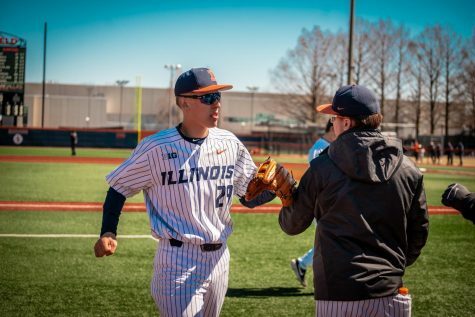 Illinois looks to take the rubber match in its first-ever home series versus Maryland on Sunday afternoon. 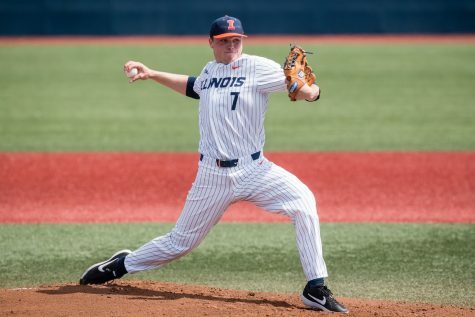 Senior Matthew James is the probable starter for the Illini, while Taylor Bloom is projected to start for the Terrapins.